You are going to Watch RWBY Volume 2 Episode 11 online free episodes with HQ / high quality. Stream cartoons RWBY Episode 21 Online Torchwick taunts the unarmed Ruby, only for the rest of her team to come to the rescue. Torchwick and the White Fang escape on a cargo train, which carries numerous mechs and weaponry. Team RWBY board the train to derail it but discover there are bombs in each car to cause cave-ins and attract massive amounts of Grimm into following the train. 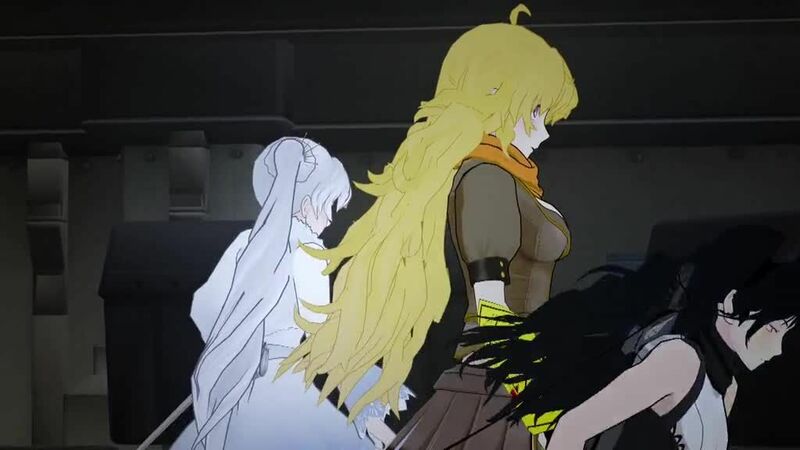 Weiss, Blake, and Yang go inside the train to stop the bombs while Ruby, Zwei, and Oobleck remain up top. Yang battles Neopolitan while Weiss fights a chainsaw-wielding Faunus, but both are defeated. Blake knocks out Torchwick and defeats Weiss’ opponent. Yang is saved by a mysterious masked woman who is powerful enough to scare Neopolitan away. Yang regains consciousness moments before the woman vanishes. The train crashes through massive steel doors at the end of the line, creating a hole into the middle of Vale, and allowing Grimm to run riot.